Dundee United have released a new accessible virtual reality tour. This is the first of it’s kind in the UK allowing supporters to experience Tannadice Park like never before. 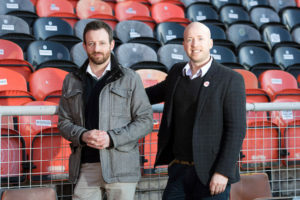 Tannadice Park is now on the map as an accessible destination and is the brainchild of OOVIRT, a Dundee based company that produces virtual tours with a specific aim to help make venues more inclusive to all. Discussing OOVIRT’s accessible virtual tour, Malcolm Roughead, VisitScotland Chief Executive, said: “The introduction of this new accessible virtual reality tour is a great example of a business using progressive and innovative technology to strengthen their connections with potential visitors. Within the virtual tour both home and away fans will be able to navigate their way around the accessible parts of the stadium from the accessible seating areas to the accessible toilet areas. Richard Meiklejohn, managing director at OOVIRT, said: “Research has shown that disabled people, their families and friends, believe many venues could do more to help disabled people access the information they need. It benefits wheelchair users, older people and those living with autism amongst others to know exactly how accessible a venue or destination will be for them. We use first hand experiences to provide the quality accessibility information that will make their visit more enjoyable, whether it’s to a shopping centre, museum or football stadium”. Find out more about OOVRIT contact the team here or call 01382 73 72 73.